We invest in training to ensure a class-leading safety culture and service delivery to our customers. Through our commitment to our crews’ training, safety, motivation and overall job fulfilment, we benefit from increased retention of high-quality, loyal seafarers and safe operations. Our safety and external inspection KPIs are among the best in the industry, driven by the significant investment we make in seafarer training at sea and ashore to standards exceeding mandatory STCW requirements. 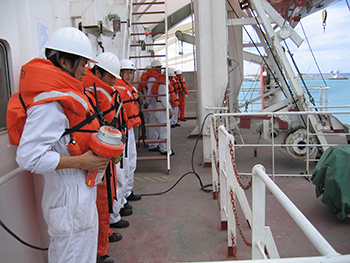 We run regular crew training seminars at our crewing centres in Dalian and Manila. These are designed to keep officers abreast of regulatory requirements, experience feedback and other developments and issues affecting our industry and our teams’ particular areas of focus. Our seminars address industry and internal incidents and near-misses and, with participant involvement, develop preventive measures. A large proportion of our shore-based staff receive external training every year provided by local trainers and leading international business schools. Our recruitment and training of international graduates and other young recruits arms our teams with keen, talented executives, who go on to demonstrate their value in our global offices. We offer a structured three-month trainee programme in which trainees visit our various departments, travel on ships, visit dry-docks, spend time with our shipping agents, ship brokers and customers, and receive an in-depth experience in all facets of dry bulk shipping.